Nate's Nonsense: You Read It Here First! When I first started writing this blog, I did it just for the kicks and it's been a lot of fun. I've enjoyed reading your comments and sharing my thoughts and items of interest I come across. Just out of curiosity, I've been tracking the number of visitors to Nate's Nonsense and I've watched it grow from about three thousand visitors a month to a recent average of about fifteen thousand per month – five hundred visitors a day has been pretty average. Every once in a while I've noticed a spike in visitors that is typically attributable to one of my blog posts being picked up by an Internet news site. The other day, I noticed something pretty amazing (for Nate's Nonsense). Someone submitted one of my older posts on the head of Henry IV from January 2011 to Reddit. In one day alone (March 1) Nate's Nonsense had 129,636 hits! All over a post from over a year ago. I'm both humbled and grateful to my readers who keep me writing. To my regulars, thanks for the constant encouragement! 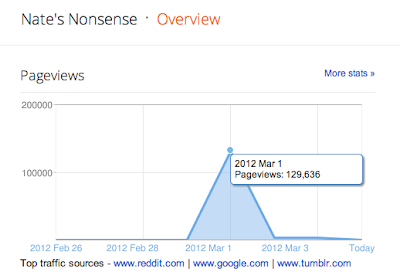 I bet the numbers will continue to grow as the word spreads, because you've got a cool site, Nate. I have recommended it to folks I know who like history, I know. Thank you for educating and informing us all. Tomorrow if I get a chance I plan to peek at that post on the head of Henry IV. Congratulations Nate! I've always enjoyed your blog. I guess I will need to go back and read again about Henry's head :) My number #1 post so far has been the one where I was without a running toilet or electricity for a week! Guess it was much more fun to read about than live!!! Would never miss a day without coming to this site. I hope you don't get fed up any time soon, I would miss you. You're the best for interesting & lively history. You don't mind being real & including your family adventures. You answer reader questions and, best of all, you're a Christian! Thanks for a great site, Nate. I agree with the others Nate. You run a great blog here. Your curiosity and love for history is infectious. I've learned alot and will continue to enjoy your site. Wow, that's amazing! That's one hugh spike. Congratulations, you deserve it! Nice work. I too try not to miss a day without visiting your site. I like to think myself a history buff, but next to you...I'm a piker. I have not been so good on the contest here lately either...by the time I get to it..someone has already solved it. Maybe I'll have better luck this week. You're a wealth of information. 130,000 hits will seem small some day. I love reading your blog.